C.1915, Ansonia Royal Bonn, "La Bretagne" porcelain mantel clock in excellent original condition. 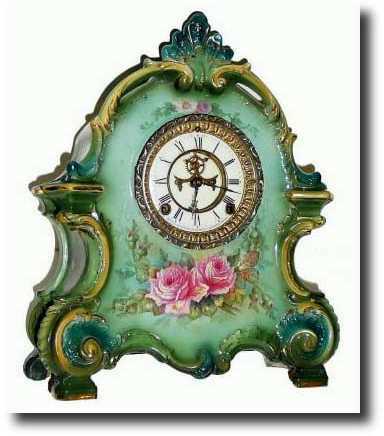 This particular clock is shades of green and aqua, with dark pink roses on the front and sides. With good open escapement movement and perfect porcelain dial. Reference Ly, 1998 Ansonia book, items 2620-23. Height 15"